In this article, you will learn to create while and repeat...while loops in Swift programming. This loop evaluates its condition at the start of each pass through the loop. The TestExpression is a boolean expression. statements inside the while loop are executed. and the TestExpressionis evaluated again. This process goes on until the TestExpression is evaluated to false. If the TestExpression evaluates to false,while loop is terminated. In the above program, the variable currentLevel and finalLevel is initialized to 0 and constant gameCompleted is initialized to true. In each iteration of while loop, it checks the condition currentLevel <= finalLevel. If the condition returns true, statements inside while loop is executed otherwise the loop terminates. This loop evaluates its condition at the end of each pass through the loop.The repeat...while loop is similar to while loop with one key difference. The body of repeat...while loop is executed once before the test expression is checked. The body of repeat...while loop is executed once (before checking the test expression). Only then, testExpression is checked. If testExpression is evaluated to true, statements inside the body of the loop are executed, and testExpression is evaluated again. This process goes on until testExpression is evaluated to false. 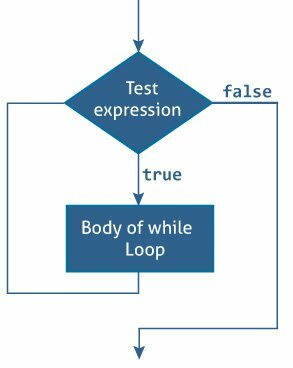 When testExpression is false, the repeat..while loop terminates. In the above example, for the first time the statements inside the loop executes. And for next iteration, it checks the condition currentLevel <= finalLevel. If the condition returns true, statements inside while loop is executed otherwise the loop terminates. Although both while and repeat while loop have same execution steps, the condition currentLevel <= finalLevel on repeat while loop is executed only after executing the statements inside it. But in while, the condition is checked at the beginning before executing the statements inside it. 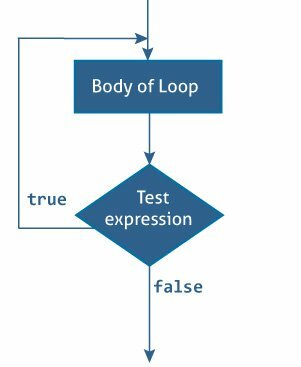 If the test expression never evaluates to false, the body of while and repeat..while loop is executed infinite number of times. When you run the program, both loop executes print("Hello, World!") statement for infinite number of times. So, you can see continuous output Hello, World! in the console.